Basil Plants | Easy to Grow, Easy to Use and a Ton of Health Benefits! 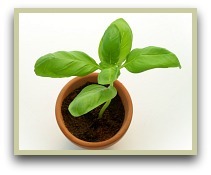 Basil plants are an excellent choice to grow at home. With so many culinary uses, this herb is the most popular and widely used herb in kitchens around the world. So much so, it's widely known as the "King of Herbs!" You can easily grow them from seeds, or bought plants, in your garden, in containers or on a sunny windowsill. Click here to read step-by-step tips and advice on this herb. The most popular type, and the variety you'll usually find sold in stores, is sweet basil (Ocimum basilicum). The freshly chopped leaves are a delight in salads and when combined with tomato. But with 60+ varieties available, growing it yourself is the best way to experience different types. I grow a few types, but the two I grow and use most are sweet and Thai. The Thai variety retains its flavours more than the sweet variety when cooked for an extended period. So my basic rule is to use sweet when preparing raw foods, salads, sauces, dressings, pesto and the like. And Thai when making pork, chicken, soup and dishes that need a longer cooking time. Some other varieties that you can grow from seed or buy from a nursery include: lemon, Greek, purple ruffles, cinnamon and bush basil to name just a few. Note: However you use it, it's a good idea to tear the leaves by hand rather than using a knife. The steel reacts with the leaves leading to the cut edge turning black. Aside from its culinary use, another reason this herb is famous for is its many medicinal and general health and well-being uses. 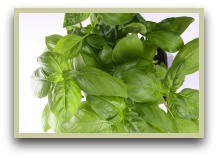 The basil herb is packed with flavonoids, which can help prevent damage to cells from day to day life. It's also rich in nutrients and contains a decent amounts of vitamins A and C, iron, calcium, potassium and magnesium. Even the fresh leaves are a digestive aid. For more on this, click to read about the health benefits. For over 5,000 years basil plants were grown only in India before, like many spices and herbs, being introduced to the rest of the world due to the spice and trade routes and merchants on their travels through Asia. An excellent and easy way of enjoying the taste and benefits of this herb is to make a drink from the chopped leaves. I often make a simple tea which is light and refreshing. Click for my basil tea recipe. If you are interested in using spices and herbs to make delicious, healthy teas and infusions, then have a quick look at my spice and herbal tea recipes book. Available as a digital book that you can download and start using and enjoying right away. Click for more information. Oregano Plant Info - All you need to know about the "Pizza Herb"